Joining a student organization can enhance a lot of your skills. Most organizations are similar, but there are ones that stand out from the rest. That’s Greek life. If you don’t know much about Greeks, I can tell you all about the one I’m apart of and why it’s so special to not only myself, but all the Greeks. Academics. Leadership. Philanthropic. Social Skill Development. These are the pillars for Gamma Phi Delta Sorority here on the UW-Stevens Point campus. 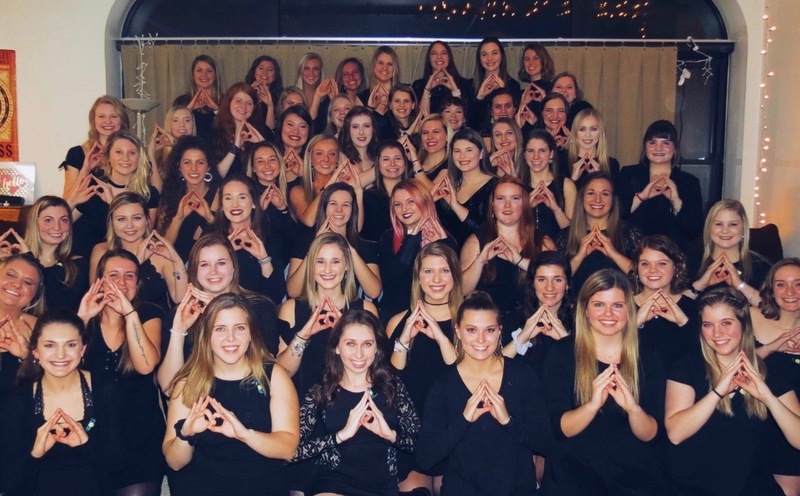 Gamma Phi Delta (GPD) is one of the four sororities UW-Stevens Point has and currently has 52 wonderful ladies. Gamma Phi Delta is well known for their service work and doing over 500 hours each semester. Helping the community is important and we’re always looking to make a change. Past events include the Pink Pumpkin run to help support breast cancer, making pet toys for the Humane Society, Feed My Starving Children, Empty Bowls, Purple Gala and plenty more! Our philanthropy work since 2017 has been dedicated to Cancer Awareness, so we try to do as much as we can to help this great cause. Gamma Phi are nationally known and received the Presidential Volunteer Service Award (PVSA) various times and the past two years they received gold status! Our sisters have completed over 1,000 service hours over a year for this incredible cause. With great service comes great academics! This sorority is also known for keeping over a 3.5 GPA as an organization each semester. Everyone has a busy schedule, but academics are so important. Not only do the sisters have great scholastic achievement but leadership opportunities as well. We continue to recognize girls for their internships, jobs after graduation, participating in other organizations on campus—I could go on! We’re putting ourselves out there to take advantage of every opportunity and no matter what happens, we have over 50 sisters to help us through it. We all love to talk. We are probably the chattiest people you have ever met, or at least I’ve met, but that’s not a bad thing. Having conversations about not only small things but the bigger, important aspects are what helps us communicate not only with each other but in the real world. We learn to express our opinion and to be open minded. It’s never too late to develop these communication skills and it’s great to do it with such a huge circle of women! I have been a member of GPD since fall of 2016. I knew I wanted to join right away because my sister was in a sorority, but I also wanted that support system I had in high school sports. After all, college is one of the toughest adventures we must go through, and you never want to do it alone. These ladies welcomed me in and I felt a part of this organization from the very first recruitment event. I knew I didn’t want to be anywhere else. Since then, we’ve gone through so much as a sisterhood. I am so grateful to be a part of an organization who has strong values, opportunities, resume building and support, which is something unique to joining a Greek organization. I could not get that in one of my other organizations. We are a sisterhood, support system, helping hand, a listener, a mentor and beyond. The sisters that I have are so special to me and I couldn’t imagine my life without them or Greek life in general. So next time you’re thinking about getting involved, consider joining a Greek organization. Give them a chance and see for yourself how much of an impact it can have on you. We have four wonderful sororities: Phi Omega, Delta Phi Epsilon, Sigma Delta Rho and Gamma Phi Delta. We also have four great fraternities: Phi Mu Alpha Sinfonia, Phi Sigma Phi, Sigma Tau Gamma and Theta Xi. Follow them on social media for any questions you have and information about recruiting! Gamma Phi Delta is not recruiting this semester, however, they have a 365 recruitment and encourage all to attend! If you want to know more about sororities and GPD, stop on by and we can help you with that! The next event is Wednesday May 1st, from 6-8pm in the Alumni room. Follow us on social media, gammaphidelta_uwsp to stay updated on future events.